Greetings and salutations, everyone; yes, once again it is I, Mani the purebred border collie, your popular host, here to bring you the latest news from the garden. You may remember me from such posts as “Beyond Super Roasting”, among so many, many others. 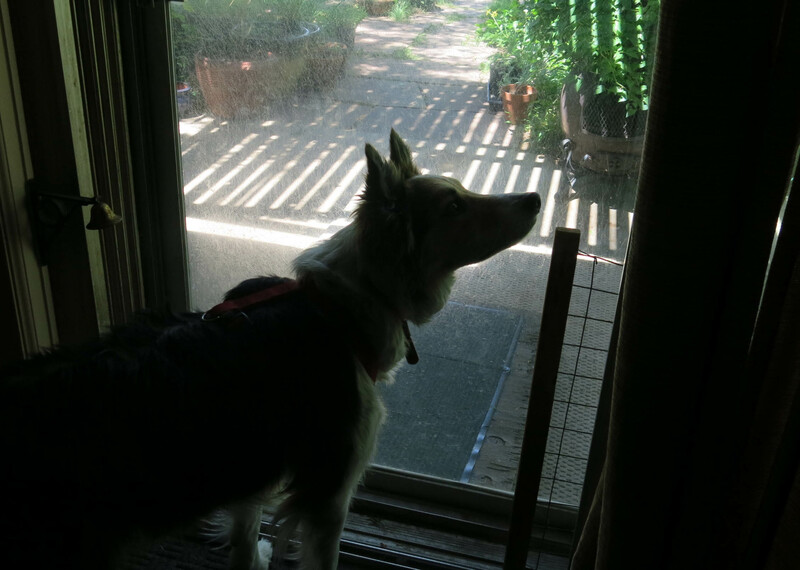 Here I am in a characteristic pose, hunting for flies. I like hunting for flies a lot. Bees and wasps, too, though the guy I live with says not to do that. I still do. He also said calling myself “your popular host” sounded a bit high and mighty, but I heard an Indian cooking show on YouTube where the chef introduced himself as “your popular host”, so there you are. The guy I live with is maybe not hugely happy with the way the Caragana microphylla are growing. They had to be staked, and now the tiny leaves are wilting. (Not because of being staked, but because it’s been so hot and dry.) The two plants were watered with a root soaker, but the guy I live with wonders if the leaves aren’t just too small. Like Japanese maples, here, the leaves are so delicate that they need to be constantly hydrated in order to survive in the sun and dry air. True, the humidity has been around ten to fifteen percent during the day (“a bit muggy”), but that doesn’t seem enough. (The drier the air, the quicker leaves lose water from transpiration.) I guess we’ll see what happens. 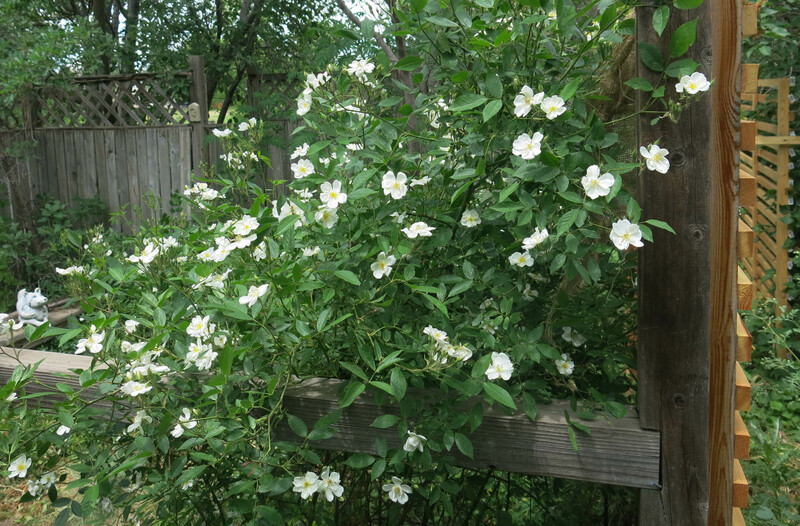 The rose ‘Darlow’s Enigma’ is in full flower now, in “the enclosure”. The guy I live with said he’s decided to replace the fences on the north and west sides. I think the apple tree, which you can see on the left, pushed the fences every which way. 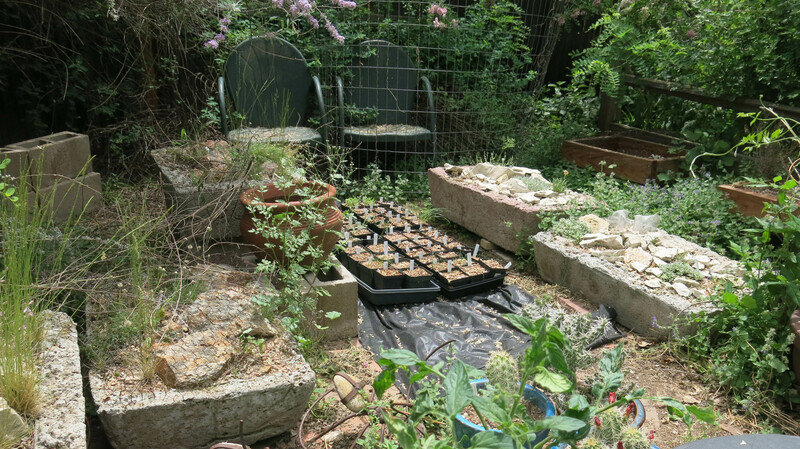 All the flats of seedlings were moved out of the bulb frame, onto the trough patio, so they would get more sun. Of course they’ll have to be watered a lot more. You can barely see the large trash can, in the lower right, which is filled with water, to dip in with a watering can. 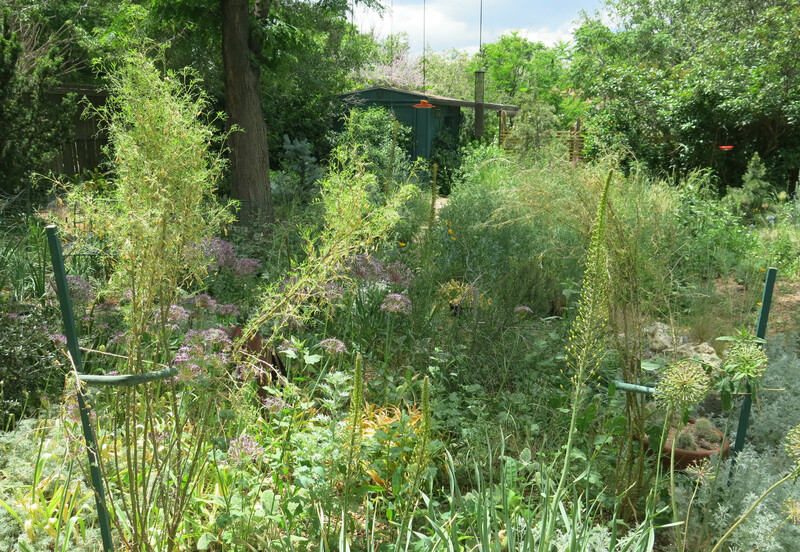 And then, there are the weeds. The guy I live with suddenly remembered the grub hoe, which he bought from Smith & Hawken many years ago. 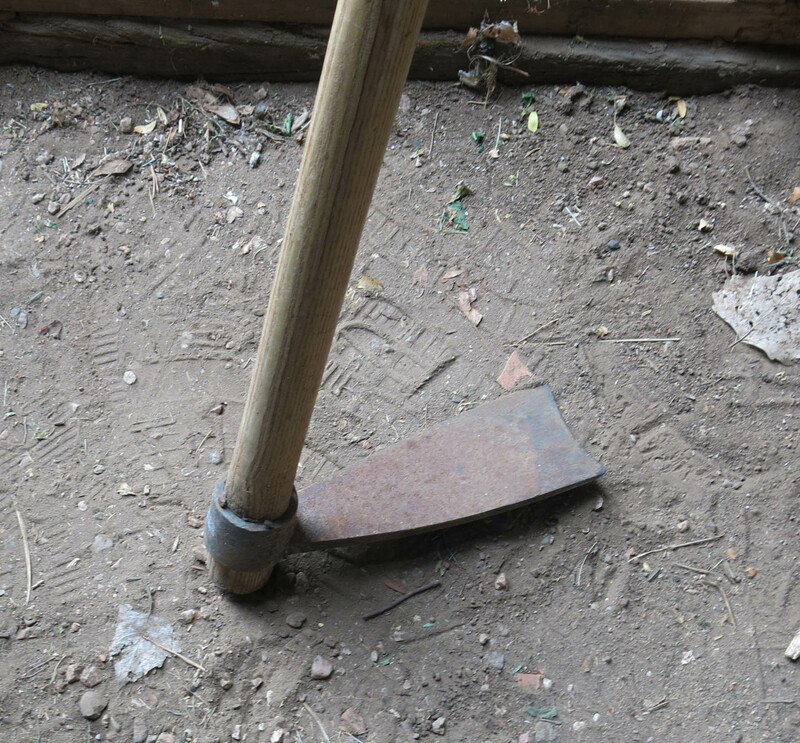 This is like a super-serious hoe; the blade was made from “rail steel” in Japan. The handle is ash, or something like that. 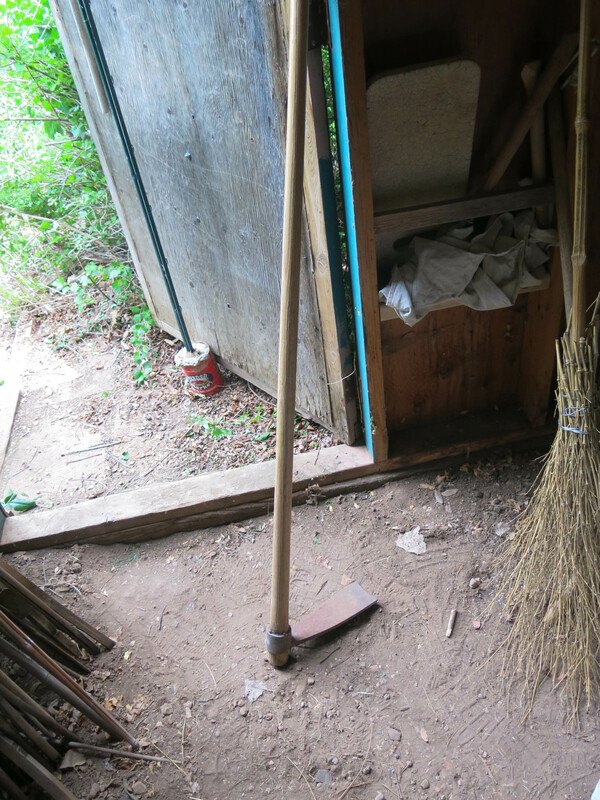 The guy I live with went at the weeds with this hoe for a few minutes in the hot weather and then got really tired. He said that weeding with this hoe was “not for everyone”. I bet by now you are really wondering about the title of today’s post. 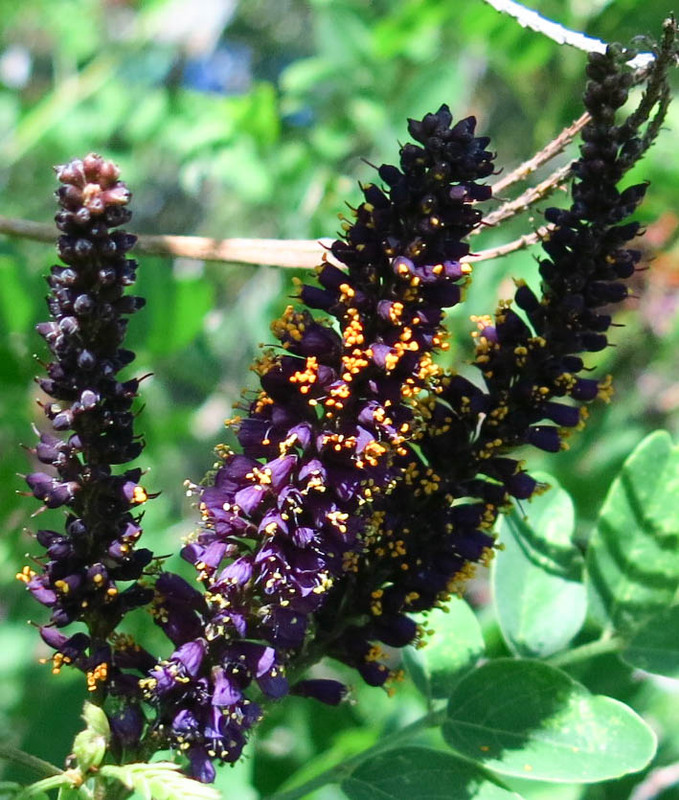 The guy I live with made me stop on my walk so he could take a picture of Amorpha fruticosa, the false indigo bush, growing along the banks of the canal. The point-and-shoot really doesn’t do justice to the flowers, but the guy I live with said he couldn’t carry the DSLR and hold the leash at the same time. Especially if he’s carrying a little bag, too. So this is what we have. 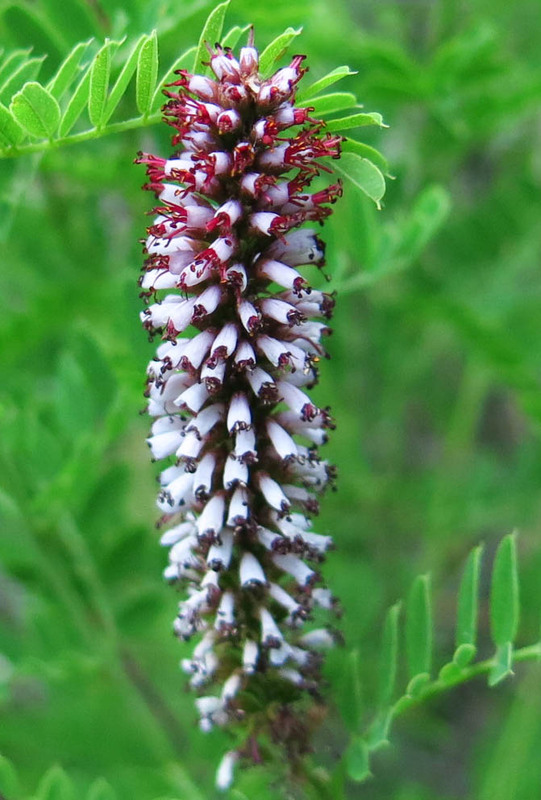 Here’s Amorpha nana, in the garden. Also with the point-and-shoot. Well, amorpha refers to the fact that these members of the pea family don’t have wings or a keel on the flowers, the way members of the pea family do, and the name means “without form”, or “formless”, though naturally the guy I live with thought “shapeless” was better. The only other thing, I guess, is what happened yesterday evening. Everything was normal. Neither of us was doing anything. It was a long, hot day, and we were ready for some leisure time. But then, the guy I live with made the mistake of looking at the weather forecast, and, yes, there was another severe thunderstorm headed our way. Number Four for us, this year. (The closer you live to the mountains, here, the less likely you are to get these storms, except this year, it seems. In general, as the storms move out onto the plains, they build in intensity, and usually all we get is a little rain and a lot of darkness.) The forecast said high winds, damage to trees and roofs, and so he told me to be prepared to go downstairs to hide. 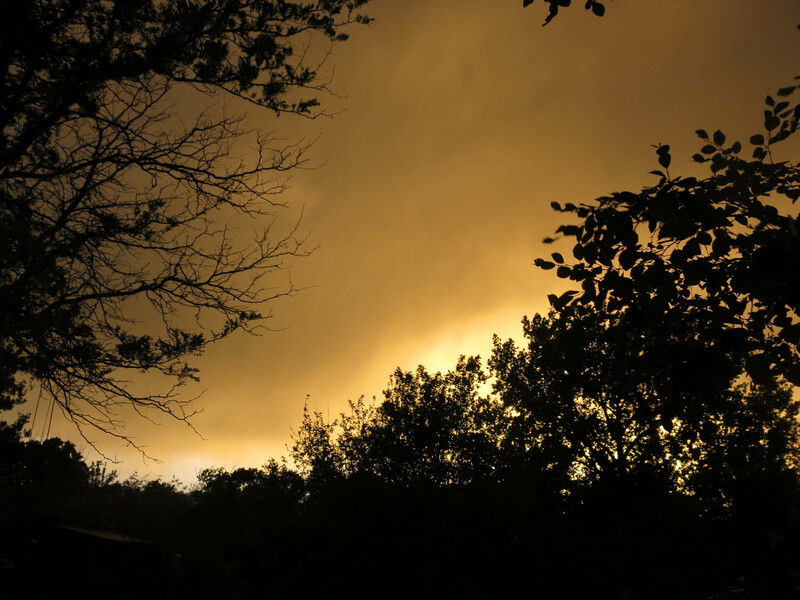 The sky was all yellow. Nothing really happened. It hardly even rained at all. 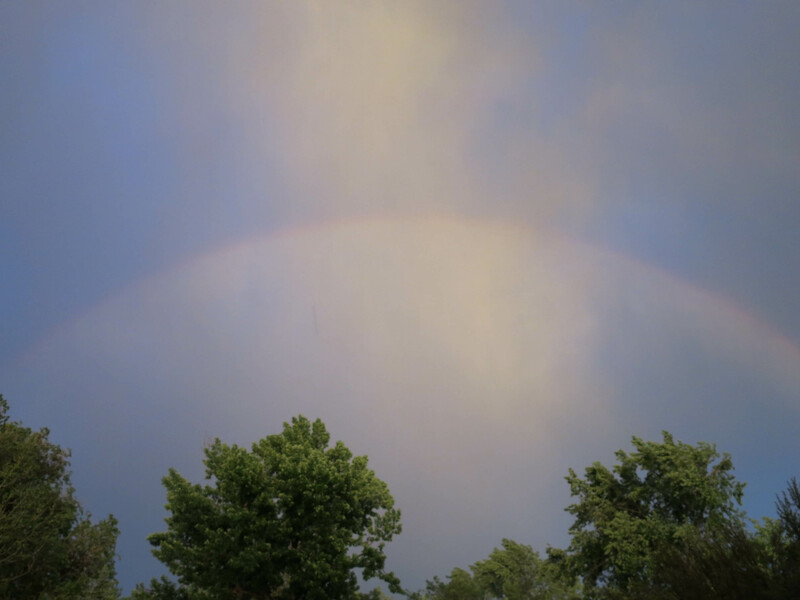 Afterward there was this strange rainbow in the east. And that was that. That’s pretty much all I have for today. What a nice happy shot of our popular host to end with. It helps recover from that terrifying yellow sky. Thanks. It was pretty scary last night, with way more thunder than I like (I like zero), but nothing happened. Not even enough rain to get all the flagstone wet. Sure; they seem to be pretty easy to grow. The guy I live with said he planted a plant of Amorpha fruticosa years ago but it died. Like a lot of other things. It gets kind of big. I’d always wondered what was amorphous about Amorpha; thanks! Now they’ll forever be ‘shapeless ones’ to me. They’re a scattered feature of coastal and other low-lying spots in Virginia (A. fruticosa), but I’ve never seen any in person — don’t venture out of the mountain valley much. I wonder if James Golden has them in his moist, coastal-region Federal Twist garden, where there’s not much in bloom in the early half of the season. Well, the guy I live with looked it up. He might have known before, but he wanted to make sure before saying anything. Amorpha nana is growing in the back yard here, on one of the raised beds which has never been irrigated. 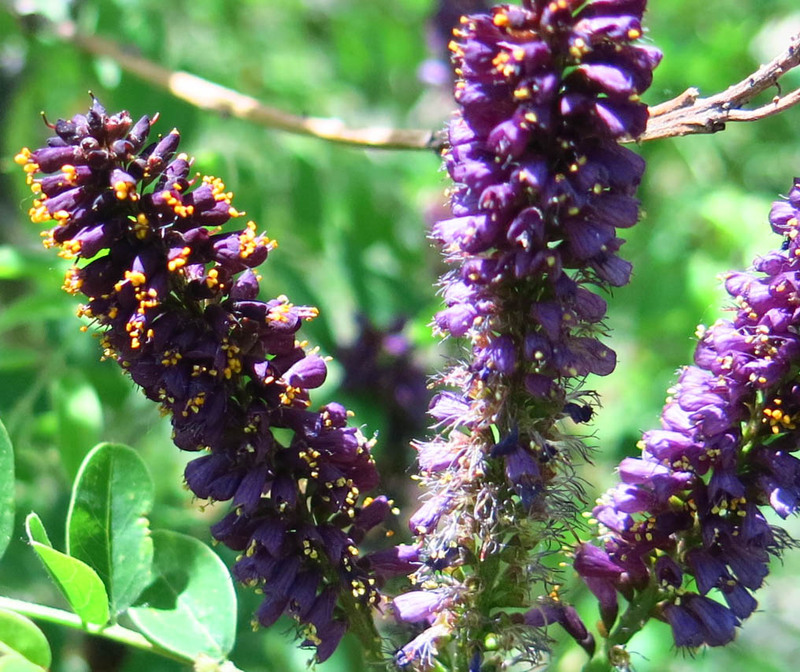 Leadplant, Amorpha canescens, is certainly the most attractive. It’s out in the front yard, here. Smith and Hawken is “not for everyone”. When they opened a store downtown, a representative called me for an interview so that I could write about the new store in my gardening column. I made an appointment early. I arrived just as the store was opening, and parked my classic F250 at the curb out front. The salesperson opening up and sweeping the sidewalk asked me to move my “old truck” because Tony Tomeo was coming by for an interview. I moved it. I went to work. The person I had the appointment with called me at work to ask if I had forgotten about our appointment. I explained that I was there right on time, but was asked to move my “old truck”, so did so. He apologized, since he was the same person who asked me to park elsewhere, and asked when I could reschedule. I declined. This was before they had stores. Now, Los Gatos is after they had a store. It went out of business. Speaking of weird plant names, what does ‘Lithodora’ sound like? Does it mean that it smells like a rock? That might make sense to you, but to humans, rocks do not smell like much. “Lithodora” means “gift of the rock”, since it grows in rocks. Of, of course. Your people are so smart. I try to tell Rhody that his people are smart, but he does not believe me. Probably with good reason. However, the guy I live with says I am extremely stupid to try to catch yellowjackets and wasps in my mouth. I would agree about wasp hunting seeming to be a stupid endeavor, but it is probably more practical than asking him to do it for you. We have Bug Jars. They’re old, tall salsa jars with holes punched in the metal lids. The lady of the house made them, because she loved bugs of all kinds, but not so much in the house. So anything undesirable gets removed pretty quickly. 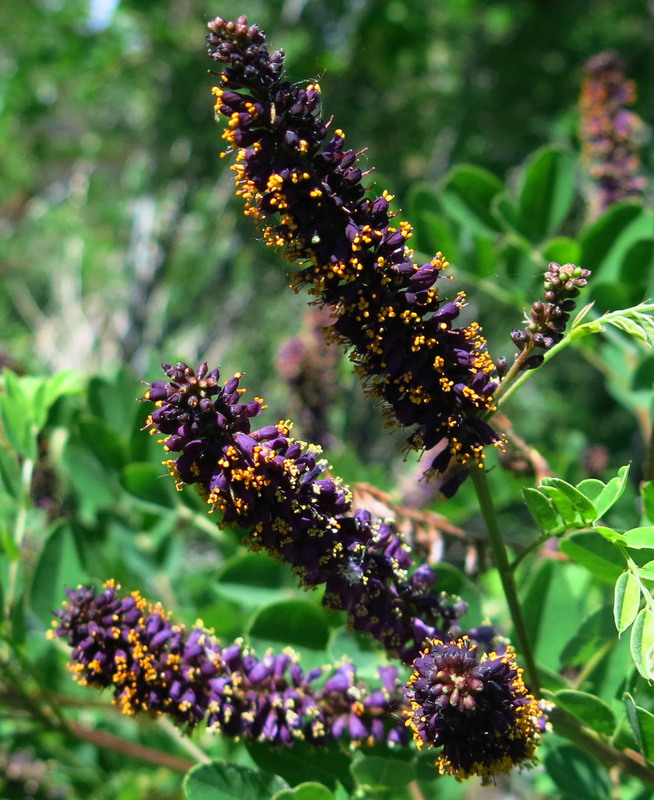 Amorpha fruticosa… one here… 11 or so years out of ForestFarm… maybe 8 feet tall now. No flowers this year. Usually reliable. Always reminds me of a long gone gothish childhood friend. It’s sort of attractive. There is said to be a pure white one. Okay, *now* I’m interested. Those dark blooms don’t show up very well at any distance. OTOH, there’s always the risk with white flowers that they’re kind of a mess as the blooms go past their peak. Off to poke around for info; thanks for the tip. Mani, do you have your personal pool again this summer to cool off in? I understand temperatures may soar this week. Leadplant is extremely attractive. Has not begun to flower here, yet. The guy I live with says maybe Prairie Nursery has it for sale. Hey Akismet. What’s with the avatar filter? No idea what this is about. If I sign in with FB, WordPress strips the small pic out. This has only happened since the Akismet spam notice began to appear. Hello, Popular Host! Any yard that hosts a Darlow’s Enigma is a fine yard. I like how the leave color compliments the flower color. I also like the colors of False Indigo. Purple and gold make a royal combination. The amorpha nana is nice too. Both flowers remind me of our buddleia spikes. I like our white spikes best of all. The wind video is super excellent. You surely get the weather where you are. We are mostly same old same old, huh boring. Which way does the wind blow today? Is it smoky? Great uncharacteristic photographs to begin and end with, Mani. 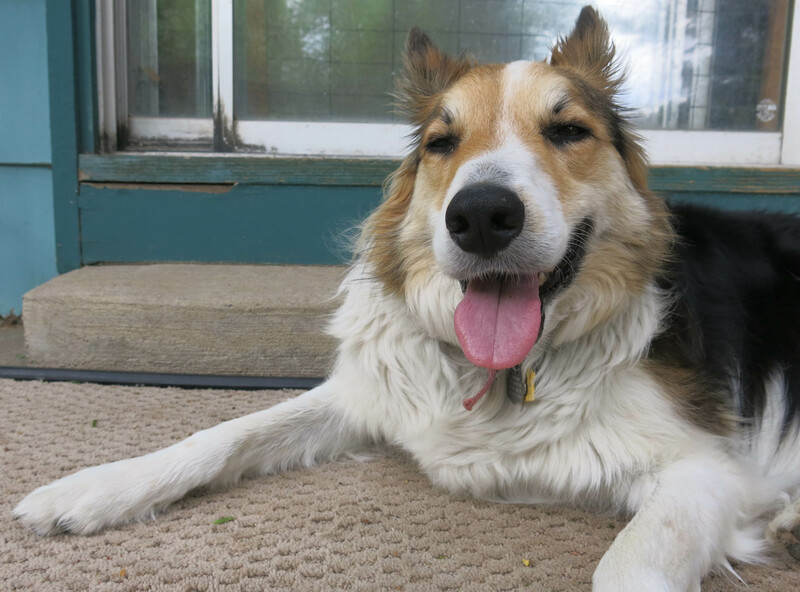 You are a photogenic dog, even for a pure-bred border collie. Thanks. The guy I live with says that lead plant, Amorpha canescens, is the most attractive one. There’s a buddleia here but they seem to need more water than they go—or—it takes some extra watering to get the roots down so that the root ball doesn’t dry out. It was hot today, and seven percent humidity. I got to play in the sprinkler. You could not possibly look more pleased with yourself than in that last photo. And why not? Speaking of bad weather, and I believe you were, how about Colorado Springs? Tennis ball sized hail? A friend’s sister lives there and it broke her car windows and did much other damage. Nothing down your way, I hope. Thanks. The guy I live with says he’s not sure why “The Springs”, which is what you call it, gets the weather it does. Pikes Peak (which is how you spell it, with no possessive apostrophe) is pretty close and you would think that being that close to a gigantic mountain would make the weather less bad, because it would take time for the storms to build up, but maybe that’s not how it works. Up north here, the farther away you are from the mountains, the stronger the storms, but not always.